The Other Room is taken from Undefinable Places In-between—a series of short essays I have written, and continue to write, under that title. There are many ways to perceive things that exist — as particles or energy, as being real or imagined, as object or concept, presumed or proven, visible or invisible. Some deep thinkers ask the question, Does existence exist? And some, perhaps more inclined to doublethink, impose perceptions of nonexistence on things that exist by making their nonexistence official. Countries with oppressive systems of government typically have many places that officially don’t exist. Particularly those rooms, buildings, facilities or precincts that result from perceptions of the lives of certain others being of lower value or a threat to the life and values of the regime. Before 1989, this room and the prison that surrounded it, did not officially exist. It could not be found on GDR street maps and it could not be located, even internally, by the people held captive within. Prisoners had no idea of where they were geographically or with whom, as inmates, they shared this non-place with. there would have once been an identity left threadbare through torture, interrogation and isolation, with a number for a name. there would have been a gross accumulation of intimate details on the same identity, obsessively compiled through the surveillance mechanism of the State. Much has been written about the attractions of Berlin to visitors. The current freedoms as well as the old repressions, the over romanticising, the overwhelming history of the place and its dark seduction, and that perennial question: How could all this happen? And the reality is that it still is happening —in many places around the world. Australia is not an exception. The new secrecy and ugly nationalism creeping into Australian politics is worrying. The potential slide into oppressive government is beginning to appear to be held less in check than we once thought. increased official secrecy and a push to control the media and the arts, the singling out of minorities as a threat to public safety, indefinite detention of adults and children, government initiated campaigns of fear, the silencing of critics, the eroding away of fundamental human rights, the prospect of draconian sentences for simply reporting the wrongs, the threat of losing citizenship, escalating surveillance — all of it, always, in the name of national security. 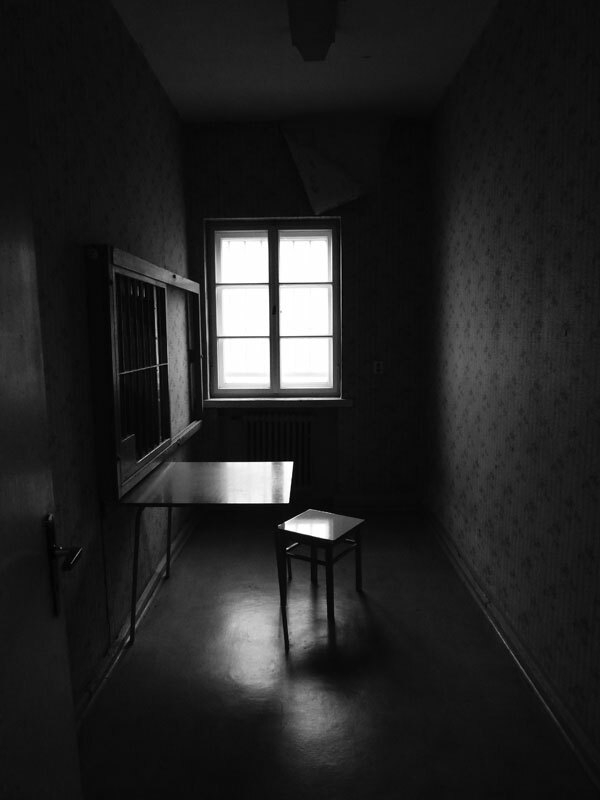 Custodial judges’ room in the former prison of the Ministry of State Security, Berlin Hohenschönhausen. Thanks to Jennifer Kunze, Gedenkstätte Berlin-Hohenschönhausen, for explaining the function of the room in my photograph.